a shady cast of characters. A Wicked Shady Deal for Maine. 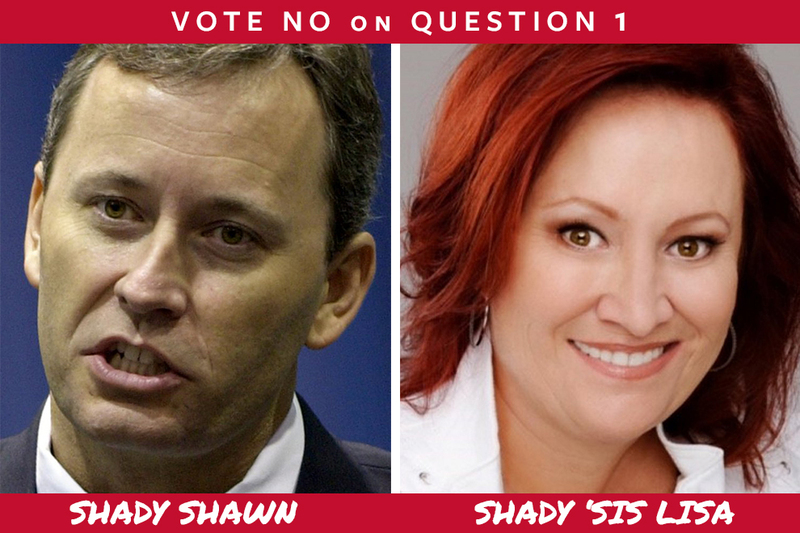 Shady Shawn is back, dealing his latest shady scheme and trying to pull a fast one on Maine voters. Question 1 is a terrible deal for Maine. Maine can’t afford to get played by this casino trickster. Shawn is pulling out all the stops to pull what could potentially be his most profitable trick yet with the York County casino referendum. Shawn specifically designed the language of the ballot referendum so that only he can profit if it passes. Maine state officials have reported that the license for a casino in southern Maine is estimated to be worth up to $200 million. That’s quite a payday for one guy - Shawn Scott. This isn’t the first time he’s pulled this trick. In 1999, he purchased Delta Down racetrack in Louisiana for $10 million before selling it for $130 million after a vote. Sounds familiar, huh? It’s always the same story with Shawn Scott. In 7 states, Shawn Scott has a pattern of leveraging slick accounting methods and legal sleight of hand to make tens of millions of dollars on referendums. A former or current employee/friend/partner (or closely tied to Scott’s businesses) personally funds a gambling referendum. It later comes to light this person actually was “borrowing” the money from one of Shawn Scott’s LLCs. That always ends in an investigation…. Shawn’s stories almost always end with extensive investigations and someone being fined. Shawn Scott made $51 million bringing Maine its first casino through Bangor’s horse track back in 2003. After winning at the referendum but before investigations into his questionable business dealings could catch up to him, Scott promptly flipped the track and sold his gaming rights. Shawn resurfaced in Maine last fall, when he spent $2 million trying to get a casino bill on the ballot - only to have the Maine Secretary of State report that almost 56,000 signatures were invalid. This year, Shawn’s sister Lisa Scott has been doing his dirty work for him. Claiming her $4.3 million donations were “personal funding,” she worked to bring another casino referendum to the ballot. But when investigators closed in, Lisa Scott stepped down from the campaign. Maine won’t let you get away with it again.